Time was when the TV play, or 'teleplay', was the jewel in television's crown. Strands like ABC 's (later Thames ') Armchair Theatre (1956-74) and the BBC's The Wednesday Play (1964-70) and Play for Today (1970-84) were held in high esteem by broadcasters, writers and critics, and regularly attracted huge audiences. During the 1980s and '90s, however, the form went into decline as broadcasters favoured series or serials set in police, medical or period settings - the dependable 'cops, docs and frocks'. Early drama on television consisted largely of existing stage plays - classical or contemporary - either performed live in the studio or filmed on stage; the remainder consisted mostly of adaptations of classic literary sources. By the 1950s, as the medium's audience began to mushroom, the demand for original material grew. In 1951 the BBC , for the first time, established a unit of staff writers. Among its first intake was Nigel Kneale , who found himself at the centre of one of British TV's first major controversies with his adaptation of Nineteen Eighty-Four (1954), starring Peter Cushing as Orwell 's hapless hero, Winston Smith. The brutality of the torture sequences led to outrage and questions in parliament. In the early days, broadcasts were live, and the inability to record transmissions meant that if a repeat was called for, cast and crew had to be reassembled for a second live performance. Because TV drama in this period was so dependent on stage actors, Sundays, when the theatres were closed, became its natural home: well into the 1960s, Armchair Theatre was still describing itself as "your Sunday night dramatic entertainment". A product of the early days of ITV - and a manifestation of the new channel's anxiety to demonstrate its cultural credentials - Armchair Theatre heralded a new kind of television drama. Sydney Newman , lured from Canada in 1958, took steps to encourage new talent, and the series was soon home to young directors like Philip Saville and Ted Kotcheff and writers like Alun Owen ( 'Lena, O My Lena' , 1960; 'The Rose Affair' , 1961), Clive Exton ( 'The Trial of Dr Fancy' , 1964) and Robert Muller ( 'Afternoon of a Nymph' , 1962), whose early works chimed with the 'angry young man' school then so influential in film and theatre. In 1960, Armchair Theatre broadcast Harold Pinter 's first work for television, 'A Night Out' . After Armchair Theatre suffered scheduling changes, Newman left ABC in 1963 to become the BBC 's Head of Drama. One of his early innovations was The Wednesday Play , which likewise became a breeding ground for new talent, including directors Ken Loach and Alan Clarke , producers Tony Garnett , Jimmy MacTaggart and Irene Shubik , and writers Jeremy Sandford , David Mercer , Tony Parker and Dennis Potter . The series coincided with a push by programme makers to persuade a reluctant BBC to let them leave the studio and film on the streets. 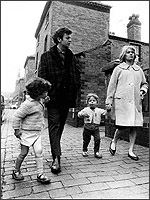 'Up the Junction' , directed by Loach from a script by Nell Dunn , drew critical acclaim, but this was nothing to that of 'Cathy Come Home' (1966), a powerful drama about homelessness - shot largely on film using handheld 16mm cameras and directed by Loach from a script by Sandford - which was a sensation in its day and has had a lasting impact: in 2000, it was voted Britain's greatest ever television programme. Other standouts included Potter 's 'Nigel Barton' plays and Mercer 's 'A Suitable Case for Treatment' (1965). But one of the most innovative BBC dramas of the early 1960s was commissioned not for Drama but Documentary. Peter Watkins ' Culloden (1964) was a powerful recreation of the massacre of the Jacobites at the hands of the English in 1746, and the subsequent ransacking of the Highlands. Watkins mixed dramatic reconstruction with pseudo-documentary techniques, including 'vox pop' interviews with soldiers and civilians. This blurring of drama and documentary forms became one of the hallmarks of progressive television drama, further explored in Watkins' next venture, The War Game . An explosive evocation of a nuclear attack on Britain and its consequences, it was so powerful that the BBC refused to show it for 20 years. As the '70s began, The Wednesday Play moved to Thursday and became Play for Today . Alongside now familiar names like Loach and Potter , Play for Today introduced new names like Mike Leigh and Jack Rosenthal . Highlights included Leigh 's 'Nuts in May' (1976) and 'Abigail's Party' (1977), Sandford 's 'Edna, the Inebriate Woman' (1971), Rosenthal 's 'Bar Mitzvah Boy' (1976), Potter 's 'Blue Remembered Hills' (1979) and John McGrath 's passionate and very distinctive 'The Cheviot, the Stag and the Black, Black Oil' (1975). Roy Minton 's bleak and angry 'Scum' suffered a similar fate to The War Game , and was eventually remade for the big screen. By the mid '70s, single drama had largely disappeared from ITV, although there were a few exceptions, notably Philip Mackie 's poignant The Naked Civil Servant (1975) and Jack Rosenthal 's witty The Knowledge (1979). In the early 1980s, the genre went into decline with the end of Play for Today , hastened by its comparatively high cost and the decision of writers like Dennis Potter to embrace the relative freedom of a four or six-part serial format - what Potter described as the 'TV novel'. Many hoped that the arrival of Channel 4 in 1982, with its remit to cater to minority tastes, might revive the genre, and early offerings like Walter (1982) and its First Love strand - which included the acclaimed 'P'Tang Yang Kipperbang' and 'Those Glory, Glory Days' (both 1983) - seemed to confirm this. But the channel's decision to move into feature film production, particularly after the surprise success of My Beautiful Laundrette (d. Stephen Frears, 1985), appeared to sound the death knell for the TV play. But the genre never quite went away. Although it has never had a long term slot since the Play for Today , and the word 'play' is about as fashionable as wide collars and tank tops, the single drama still turns up in the schedules, and still has the power to surprise and impress. Jimmy McGovern's Hillsborough (1996), about the 1989 football stadium tragedy, demonstrated the unique impact the form can achieve when dealing with a specific issue, as did the more recent Gas Attack (Channel 4, 2001), about racist attacks on Glasgow asylum seekers, and the award-winning Out of Control (BBC, 2002), a harrowing exposé of Britain's young offenders' institutions which was at least as powerful as 'Scum' , a quarter-century earlier. In the past, the TV play has spawned several successful series and serials: Callan (ITV, 1967-72), Rumpole of the Bailey (ITV, 1978-79; 1983; 1987-88; 1991-92), The Sweeney (ITV, 1975-78) and Boys from the Blackstuff (BBC, 1983) all had their origins in one-offs. But it has been more than a testing ground for other, 'higher' forms of drama. The long-running strands, particularly, gave opportunities to numerous young writers and directors new to television, while the 60-90 minute format allowed them to develop a distinctive voice without the pressure of sustaining a multi-part drama. Perhaps most importantly, the TV play, at its height, encompassed a huge diversity of themes and styles, beyond the endlessly reworked formulae that have come to dominate mainstream TV drama today. Powerful drama about society's indifference to the destitute. Absurd satire about conformism and a strange medical practice.